It was smiles all round this morning as GCSE pupils from Foyle College received their results. The school would like to congratulate its pupils for all their hard work and wish them all the very best in their future courses and careers. AS/A2 Results on Thursday 18th August from 8.30am. GCSE Results on Thursday 25th August from 8.30am. Results cannot be released over the phone. All Junior School pupils participated in a#somme100 commemoration today, organised by the History Department. Special thanks to Euan Berry, 10E, for the excellent idea! As part of the PTFA’s fundraising efforts this term, Y8-11 pupils completed a sponsored walk on the morning of Friday, 17th June, from our existing school sites to the new Foyle College site on the Limavady Road, encouraging each pupil to raise £10 in sponsorship for their efforts. Amazingly, they managed to raise £4412! The route, approved by the PSNI and chaperoned by the staff of Foyle College, involved walking from the Junior School Campus on the Northland Road towards to Senior School Campus, where Y11 pupils began their walk. Pupils proceeded down the Duncreggan Road, crossing at the Strand Road junction towards the Embankment’s pedestrianized quayside path. Crossing at the Peace Bridge, pupils walked through Ebrington Parade and St Columb’s Park, before having a well-deserved break in Foyle Arena, where refreshments were supplied. Congratulations to the two Yr8 teams who presented their poster presentations at Scifest today. Scifest Northwest and the ‘Big Bang near me’ program entertained the Yr8 STEM group with a Science show, MAD IT workshop and a series of exhibitions from local industry. There were over 40 projects presented at the competition. Both teams enjoyed the experience of talking to three sets of judges about the projects they have been working at during the term. One of our teams: Jakob Fielding, Molly Hannaway and Mary Demirova were placed 1st in their chosen category winning the ‘Discover Space Award’. 'Learn To Earn' is an engaging and thought provoking Young Enterprise programme, that challenges Year 11 pupils to make the connection between education, training and employment. Pupils engaged in a variety of different activities such as 'Who am I? ', 'Who is successful?' and playing the 'Success' board game. These activities helped them understand how the learning and training opportunities available in school and the decisions they make now will influence their future careers and their happiness in later life. 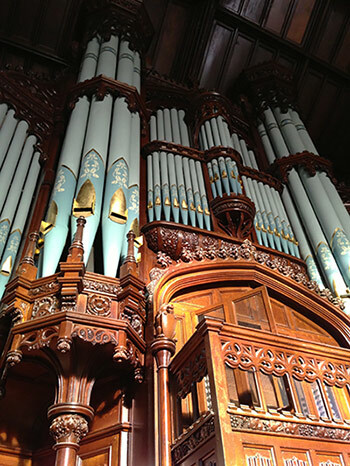 The Honourable The Irish Society and Derry City & Strabane District Council are jointly promoting a concert in the Guildhall at 3.00 p.m. on Sunday 26th June 2016 to celebrate the initial refurbishment by Wells Kennedy Partnership of the 3,000 pipe organ. Catherine Ennis, President of the Royal College of Organists and Resident Organist at St Lawrence Jewry church in the City of London, has agreed to perform and will be accompanied by Codetta, the internationally acclaimed Chamber Choir from Londonderry. The performance will feature choristers from Christ's Hospital School, which has historic connections with the City of London and also from St Mary’s College in Derry. The Irish Society and the Council have also been raising sponsorship from charities in the City of London and local businesses in Londonderry. All proceeds from sponsorship and ticket sales will be donated equally to the Foyle Hospice and the Mayor of Derry’s annual charity appeal (Action Cancer and the Tear Fund). Please support this good cause by purchasing a ticket and encourage your friends to come along too. We very much hope this will be a ‘sell-out’ and with your help it just might be. The Foyle Down Syndrome trust were awarded a cheque for £3000 pounds last week thanks to Year 14 pupils Lydia Cullen, Amy Gardiner and Aaron McFarland. Year 14 pupils took part in a YPI (Youth Philanthropy Initiative) event in January where groups of pupils from each form class presented on why their chosen charity should benefit from a £3000 prize. The Foyle Down Syndrome Trust were delighted to be the winners of this competition. Fifteen schools from across Northern Ireland took part in YPI this year, raising £45000 for local charities. Each charity officially received their cheque last week at a presentation at Queen’s University, Belfast. This provided the opportunity to see some of the winning presentations from other schools and to gain a greater insight in to the worthwhile work that YPI are doing in Northern Ireland. Photographs from our annual Yr9 Castlerock Science visit and Yr8 Nesswoods science trip can now be viewed on the school gallery. Yr9 travelled by train to Castlerock and considered a range of projects including train speeds, banded snail populations, convection currents in land and sea breezes and marram grass growth. Yr8 had fun sampling the invertebrates, considered the soil pH and discovered if moss growth on tree trunks can give directions?! Pupils enjoyed poetry with the ‘environment theme’ over lunchtime as they ate their planned ‘healthy’ packed lunch- lots of connected learning in evidence!